Oceans form the earth’s largest life support system. They produce 50% of the earth’s oxygen, and absorb the majority of our carbon. They are a crucial part of the cycle that produces our rain, and provide over a billion people with seafood as a main source of protein. But overfishing, the destruction of coastal habitats, pollution and climate change are threatening their health and the very survival of the vital ecosystem that depends upon them. This deteriorating situation imperils us all. Callum Roberts is professor of marine conservation at the University of York. His research focuses on threats to marine ecosystems and species, and on finding the means to protect them. His main research interests include documenting the impacts of fishing on marine life, both historic and modern, and exploring the effectiveness of marine protected areas. For the last 25 years he has used his science background to make the case for stronger protection for marine life at both national and international levels. His award winning book, The Unnatural History of the Sea, charts the effects of 1000 years of exploitation on ocean life. 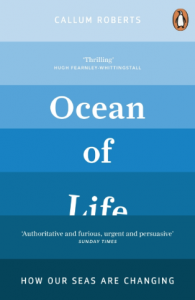 Callum’s most recent book, Ocean of life: how our seas are changing, shows how the oceans are changing under human influence and was shortlisted for the Royal Society Winton Science Book Prize. His research team provided the scientific underpinning for half a million square kilometres of marine protection in the North Atlantic that was established at the OSPAR ministerial meeting in September 2010. In 2015 he was named by BBC Wildlife Magazine as one of the UK’s fifty most influential conservation heroes.